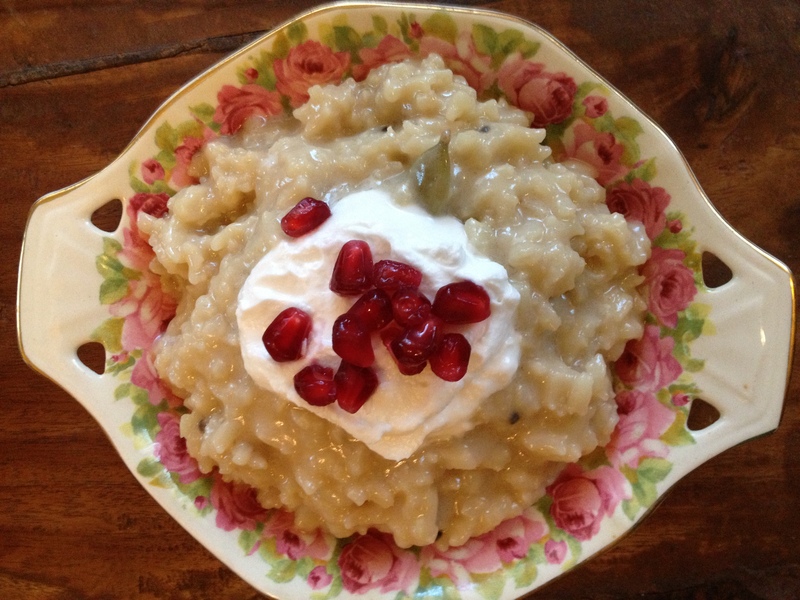 Because my Power Word for 2013 is HEALTH, I’ve been modifying a few of my favourite recipes. This creamy-sweet rice pudding has the added lusciousness of Indian spices, and is entirely dairy, gluten and cane-sugar free. And it’s vegan to boot, for those of you who are lovers of plant-based diets. It can be eaten warm or chilled, so it’s perfect for any time of the year. Ingredients: 1 x 400ml can of coconut cream, 1/2 cup of rice of your choice, 12 green cardamon pods, an inch of freshly grated or finely chopped ginger root, 1/3 cup of palm sugar, raw honey or maple syrup (or to taste), pinch of salt. 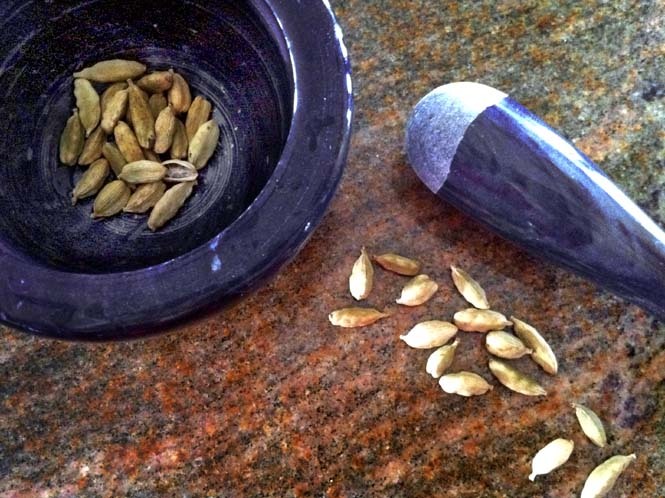 Using a mortar and pestle, lightly crush the cardamom pods. You could also do this with the blade of a heavy knife. This releases the aromatic oils from the tiny seeds inside the pods. If you are especially finicky you can pull out all the green pods, leaving just the seeds, but I never bother. They soften up when you cook them, so you can either eat them or dig them out later. Tip your can of coconut cream into a large saucepan, and then use the empty can and add one and a half cans of water to the pot. Grate your ginger and add the ginger and crushed cardamom to the pot, then bring to the boil. Now slowly sprinkle in your rice, stirring well. Let it boil for a minute or two and then bring your pot down to a slow simmer. Stir every so often so it doesn’t stick on the bottom. It will take about 40 to 60 minutes for your pudding to cook, depending on how low you have your heat. (Add a little more water if needed.) 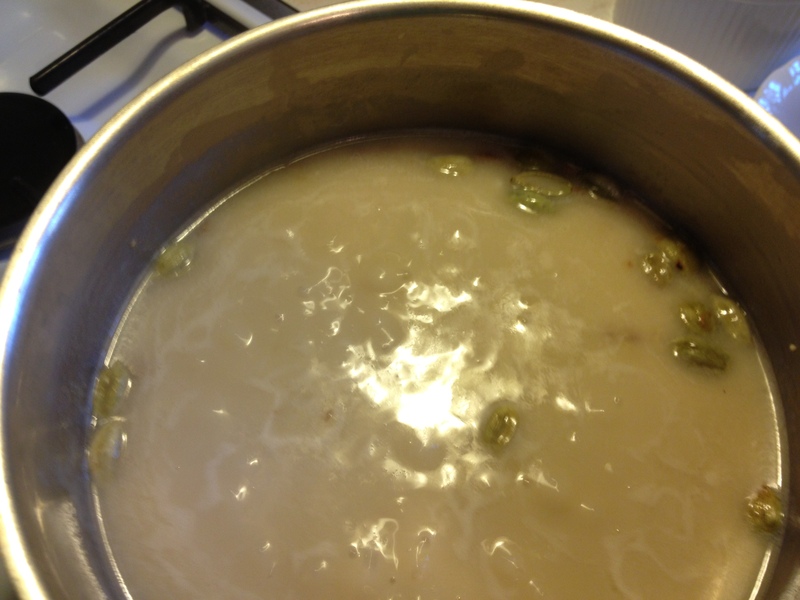 Test the rice – if it is soft, and the mixture is thick and creamy, it is ready. Add in your sweetener, checking as you go, so you don’t add in too much. Then add a pinch of good salt and check that you are happy with the taste. There is nothing more to be done except eat and enjoy! Some of my favourite serving options include a spoonful of creamy coconut yogurt (you can often find this in health food stores) over the top, and a little seasonal fruit. For a special occasion, layer it into a glass with some fresh or preserved fruit and a good yogurt, and top with some crushed pistachio or toasted crushed cashew nuts. This entry was posted in Breakfast, Gluten-free, Sweet treats, Vegetarian/Vegan and tagged breakfast, cardamom pods, comfort food, cooking, dairy free dessert recipe, food, gluten free dessert recipe, health, healthy dessert recipe, indian spices, rice pudding recipe, vegan dessert, vegetarian by Cauldrons and Cupcakes. Bookmark the permalink. Thanks for another beautiful recipe Nicole – one I am allowed to eat :). The Christmas Plum pudding went down so well I had to give a copy to my daughter. I’m sure she’ll want this one too. Many thanks for sharing. Thank you for sharing. Looking forward to making this one and definitely going to try it as a breakfast option too. Looks absolutely wonderful! I love all of these flavors. Your kitchen must have smelled diving too! It really did. And doubly so because I had just cooked up a humungous pot of spicy dhal with lots of fresh tumeric, galangal, ginger, bush pepper, coriander and other good things. I hear that the big Hollywood thing is to add turmeric powder or paste to moisturizer! I would think that it would turn you orange or yellow, but maybe they don’t add that much? LOL – I’d end up looking like some weird yellow-hued alien. I prefer to take it internally. Who cares if your digestive tract is stained orange? And the taste and colour of fresh tumeric? Aaaah. Heaven. 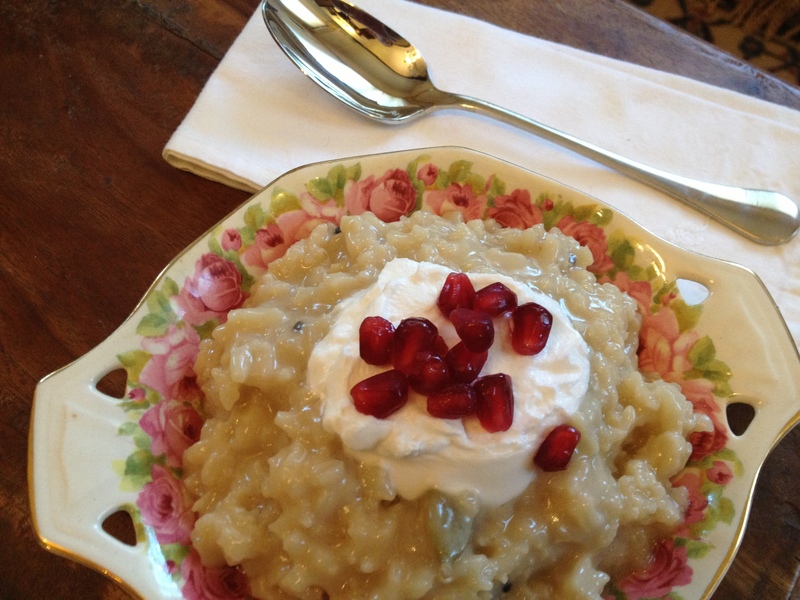 Rice pudding has to be one of the most comforting foods ever – add ginger, coconut and cardamom and I want to eat it every morning! I will try the recipe at some point, though I’ll most likely go with powdered cardamon and ginger. The fresh sounds better, but I’m lazy in the kitchen. 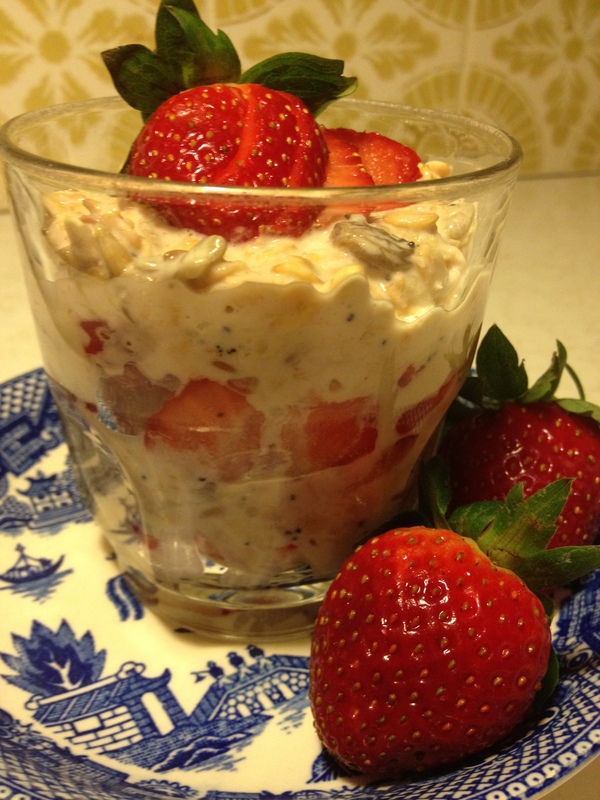 Hi Nicole – I just made this tonight, it was divine and so tasty! I didn’t bother with a sweetener and it was still fantastic. Thank you so much for sharing this recipe. Very satisfying! Please tell me what the yield is for this wonderful looking recipe. Also, not cocoa nut made li, but coconut cream? Is coconut cream sweetened? Thank you!